With the NBA's regular season in the books we can fully evaluate each players performance. 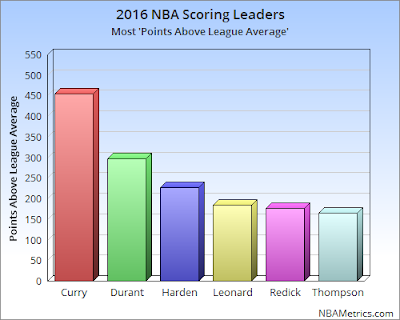 To identify the most valuable scorers NBA Metrics uses 'Points Above League Average'. To compute Points Above Average just find the players actual points scored and reduce it based on their expected points. The more shots a player takes the higher their expected points will be. Low usage guys will have lower expected points totals. This season Stephen Curry scored an incredible 455 Points Above Average. While another high usage guy Carmelo Anthony produced 34 Points Below Average. The Knicks star forward is penalized for missing a lot of shots while Curry is rewarded for converting on two-thirds of his true shots. is practically off the chart.